This thread is for any creator/artist who is experimenting with new styles, new programs, new brushes, and anything else artistically that they might want a second opinion on from their fellow creators, whether you're starting a new comic, or switching styles in your currently running comics, or just trying to decide which outfit looks better on your character. If you're not comparing one piece with another, and just one some feedback on one piece of art, then please upload the image so we can see it and give you our feedback. Be sure to express your opinions clearly, concisely, and kindly. If you think Picture A looks better than Picture B, state why in a respectful manner, but remember that everything's subjective, and no one is obligated to agree with you. Don't be unnecessarily hostile or rude when expressing your opinions, either. Ex. "I think the coloring works a lot better here than it does there because of these following reasons!" works a lot better than . . .
"i like this better because it's better and the other one looks like garbage." Try your hardest to include some reasons other than "I like it more". Elaborate on why, whether it's the style or the color choice, or whatever reason it may be. It helps the creator pinpoint what they can fix too if they feel it needs fixing! Creators, remember that your choice is final. When sharing comparisons and having a hard time deciding, take people's feedback into account, but don't feel obligated to picking one or the other just because more people side with one. At the end of the day, it's still your decision, and it's still your comic. Do not post if you're already set on your decision. If you're just looking for validation in your decision, then ask people for their opinion on the design you're sure of, see if there's anything that needs fixing. But don't come into this thread and ask for people's opinions and then deliberately argue and fight with anyone who happens to disagree with you. If you aren't looking for varied feedback and opinions that don't line up with your own, don't come in asking for it. That's pretty much it! Hope we can get lots of use out of this thread! Here is my first draft of my first page of my first comic, Dislocated, currently no idea what to put for a title card so there's just white space at the top, i want feedback on the dialog though, different font, edit the text, et cetera. I linked the wrong one! Here. My work is still a bit new on this site, and I'm still learning what I can. Any help or advice that anyone has, I'll take it. Uzuki! ** raise hand ** got a Question here! Is it acceptable to post images here asking help on certain technique, like; Perspective, Line, Proportions? Or this Thread is PURELY artistic design ONLY? You're definitely on to something with the way you're handling the colors! I'd say the main thing that stood out to me was that when it comes to outlining, I would always stick to darker colors. So the color that is filled in should always be lighter than the outline, unless you want to give the impression that the object is glowing or something. Other than that, it never hurts to outline with all sorts of colors, so long as they're dark enough imho! Perspective, line, and proportion counts as artistic design Feel free! I realize that you make this thread 11days ago? WHY I DIDN'T SEE IT?? Not bad! But there is a lack of punctuation pretty much everywhere. Be sure to fully indicate where one sentence ends with a period or question mark. 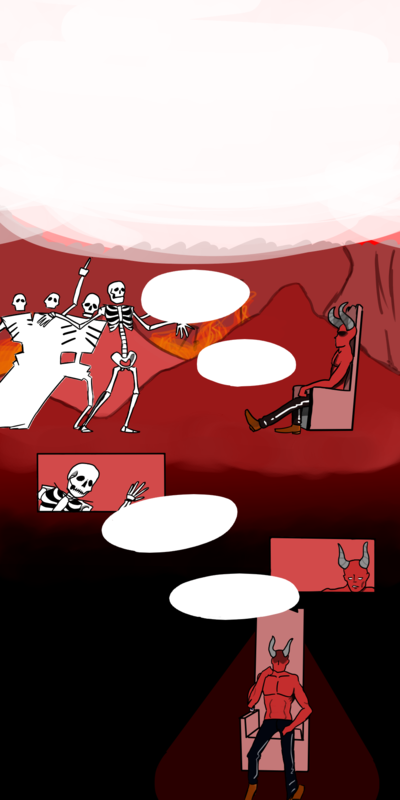 Also in Satan's last speech bubble, it should be "It's why you're here" instead of "your"
Also in this section, I was unsure which bit of text to read after the skeletons' question in the bubble. Am I supposed to read the white text? Because my eye immediately jumps to Satan's speech bubble. So I feel a little bad about posting this because I just started my webcomic here but I've been experimenting with color so may end up posting new pages. I've always had issues choosing colors that look good so I'm not really sure how I feel about so any advice would be helpful. Below I have the original first page posted next to the once with color (the second one I haven't changed the color of the text yet but I do plan to to make it more readable). I've been experimenting recently with painting in Bent Pins when I have enough time to put a little more effort into it, and I was wondering what people thought. I know it's not perfect, but I was wondering if anyone had any suggestions. Been mostly just using the dry brush in photoshop. I think the color palette looks good. You're off to a good start! A whole other thread can be devoted to color theory though so if you really want help in that department you can create a new topic. But if you just want to experiment with different color palettes, I highly recommend this site, design seeds, where they draw palettes from photographs. Hey guys. Yesterday I made my first comic post for my Naruto Spin-Off series but i'm debating how I should do my panels. The one on the left is what I posted yesterday but I think I'm leaning towards the more standard boxed panels on the right. Because the series is called Konoha Delinquents, a friend of mine suggested that it would be cool if all the panels were out of shape and distorted like they are on the left. He said this kind of accentuates the idea that the students are problematic and outside the norm. Which I agree with but I feel like it just doesnt look as... nice? But that would be the whole point right.. for it not to look neat and tidy. But maybe thats not a good idea to do that because readers might feel it just looks messy and amateur, putting them off forever? Maybe its a bit too "edgy" you know. Pretentious even?... Im really not sure. The one on the right looks nicer to me but its hard to tell if thats just because its what Im used to. What do you guys think. I really could use the feedback! Awesome. Thanks for that suggestion and the sidenote Yeah im leaning to the right too... but I guess im worried that im just being a chicken by playing it safe with that one. Thanks! I went ahead and made the topic here if anyone else is interested. Also, that website is awesome! Just joined...as of yesterday! Our team has worked for over a year to make our Dead Last comic book a reality. Curious to get your feedback on if the look works? We're going for "Full Metal Jacket" meets "28 Days Later" with a bit of "Hunger Games" in the mix...Zombie Hunger Games that is...Also would like to know what type of zombies that haven't been used/over-used and what people want to see in our zombies. Keep in mind that our first issue has a lot of sociopaths posing as zombies. Confusing enough already? ?